Did I ever tell you about my beginning, when I was young… and my first love? The lucid Harry recalls a quarter of a century earlier when he was in Paris as part of the “Lost Generation”, a real-life exodus that found American authors and artists like Hemingway, F. Scott Fitzgerald, and Gertrude Stein conducting their art and affairs against the romantic backdrop of 1920s Paris. It’s a place for painters, sculptors, and writers, and the few who are “just trying to be happy” as Gardner’s Cynthia Green would offer for her own motives. This little ditty had everything: drama, tragedy, love, and poetry… simply everything! 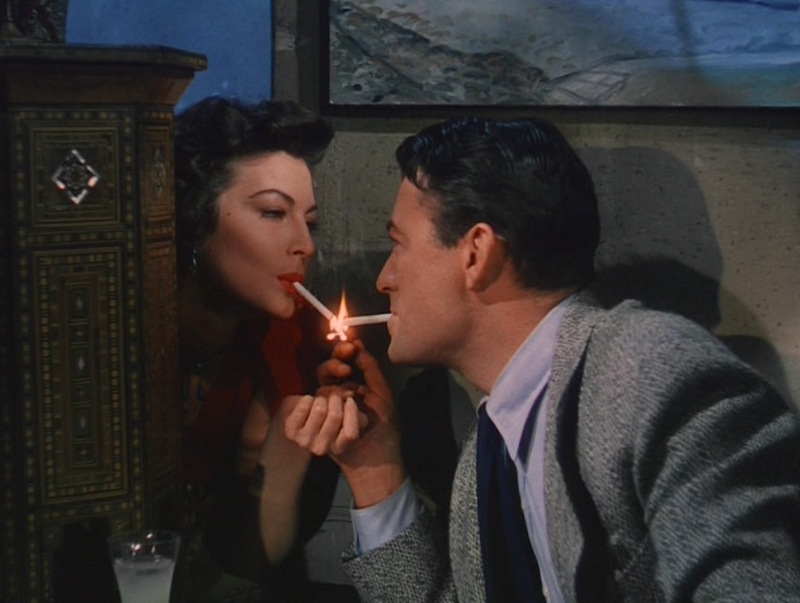 The strains of accordion music transport us to springtime in Paris, where a tweed-coated Harry Street struts in and gregariously greets the proprietor of Café Emile and orders a drink before he catches sight of the dazzling Cynthia Green (Ava Gardner) and cuts in to dance with her. Harry wears a tweed sport jacket in a birdseye weave of alternating gray yarns, woven in a manner that creates an imperfect stripe effect. Harry can’t take his eyes off of Cynthia. Love at first sight. 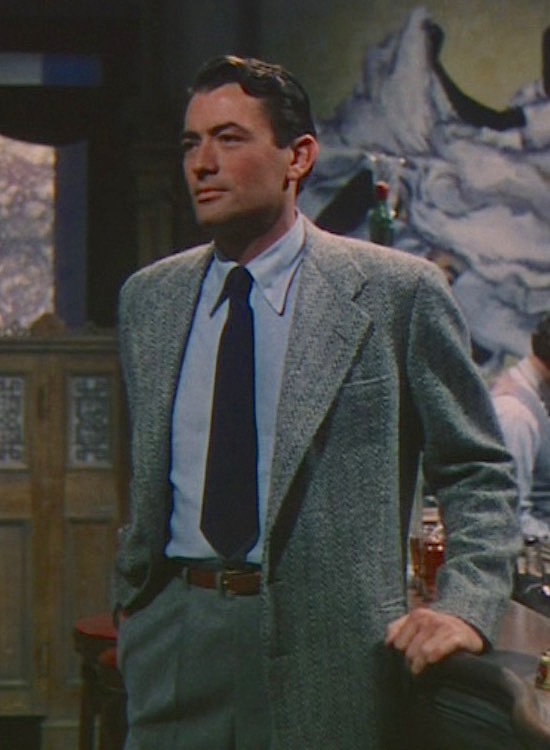 Gregory Peck didn’t become a customer of the famous Huntsman tailor shop on Savile Row until 1953, the year after The Snows of Kilimanjaro was released, so it’s unlikely that we may ever find out who tailored his sharp costumes, designed by the celebrated Charles Le Maire. 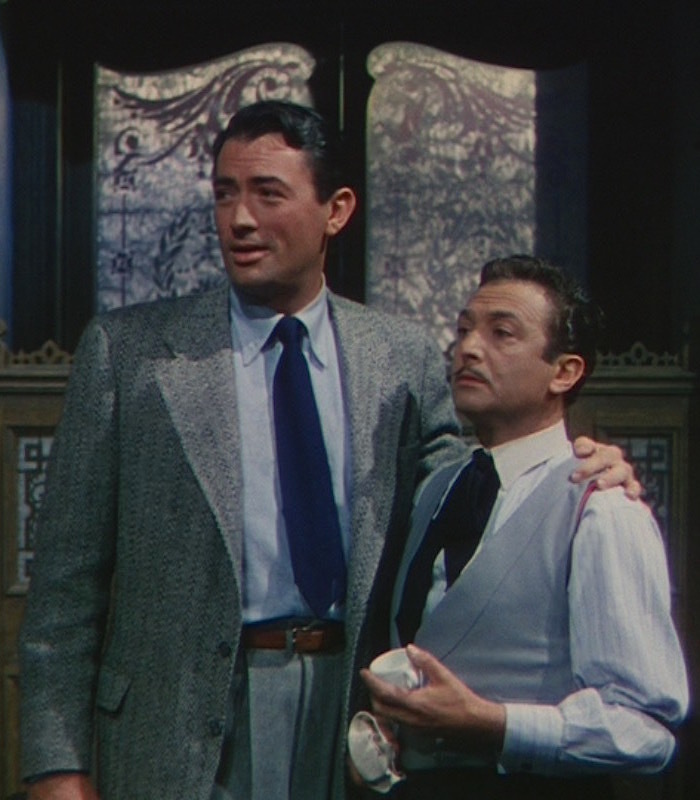 Peck and Le Maire had worked together before on Gentleman’s Agreement (1947) and The Gunfighter (1950), and Le Maire’s contemporary approach to 1920s period costuming can also be seen in The Razor’s Edge (1946). This particular sport jacket has substantial notch lapels that roll to a low stance with two sky blue plastic sew-through buttons that match the four buttons on each cuff. The ventless jacket has a welted breast pocket and straight flapped hip pockets, though the left pocket flap is occasionally tucked in to the pocket himself when Harry arrives at Emile’s. 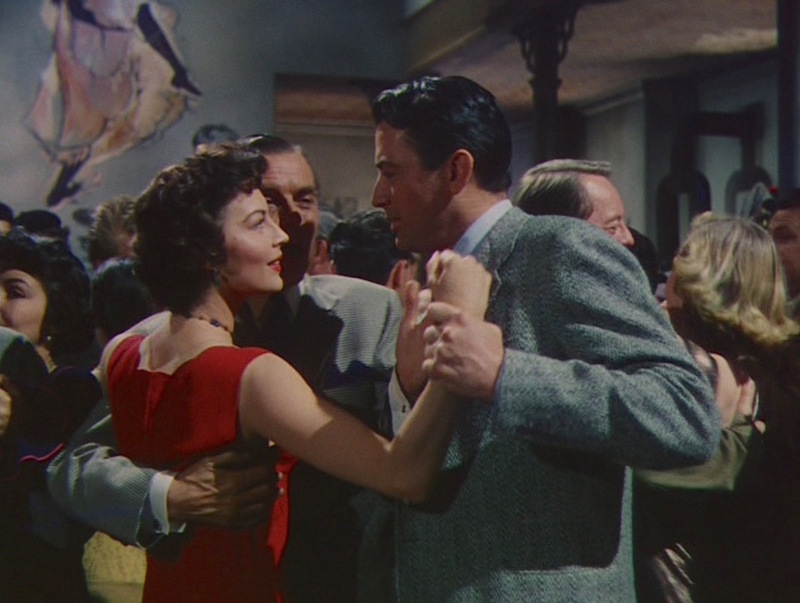 Harry can’t help but to try to steal a dance with Cynthia, cutting out Compton (John Dodsworth), her presumed date for the evening. Harry wears a light blue cotton shirt with a soft spread collar with long points, a front placket, and rounded barrel cuffs that close on one of two buttons like many modern inexpensive, ready-to-wear dress shirts. He wears it with a dark royal blue silk tie. Harry’s light gray flannel double reverse-pleated trousers have do not contrast much with his jacket, creating a suit-like effect when seen from afar. The trousers are finished with turn-ups (cuffs) on the bottoms and have side pockets where he frequently keeps his hands, though they’re likely styled with two back pockets like all of his other trousers. Through the trouser belt loops, he wears a brown leather belt with a squared brass single-prong buckle. Harry may have benefited from a stronger contrast between jacket and trousers, perhaps by wearing charcoal rather than light gray trousers, but at least the pattern of his tweed jacket provides some visual differentiation. The scene shifts from the boisterous Café Emile to a slowed-down jazz bar where Benny Carter serenades the crowd with his smooth saxophone improvisation. Reclined against a wall, Harry kicks out his feet, clad in a pair of brown suede cap-toe oxfords and light gray socks. Harry sits on the floor of a crowded but quiet Paris nightclub, drinking Pernod and listening to jazz. 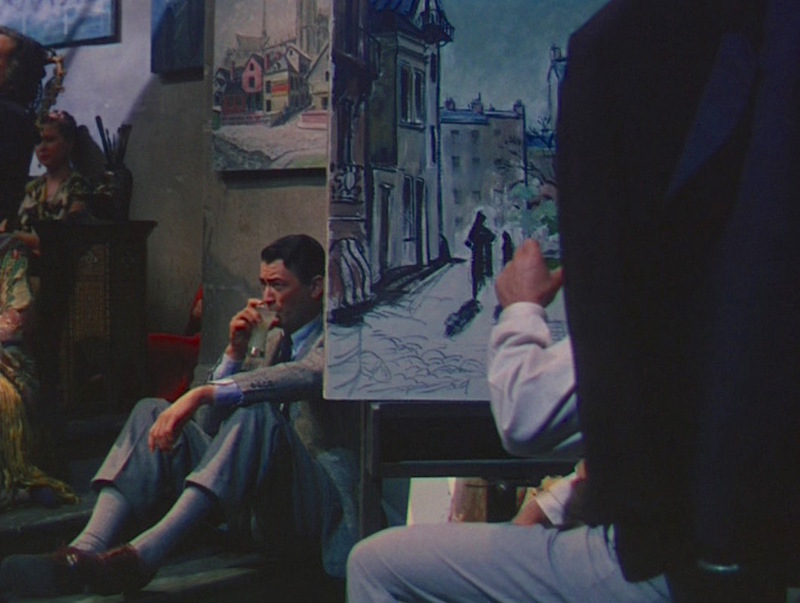 Just a few feet to his left sits an artist, studiously working on a painting of a Paris street, while to his right is the alluring woman he’ll fall instantly in love with. Welcome to the Lost Generation. Harry’s dark gray felt fedora has a black ribbed grosgrain band and a self-bound brim reminiscent of “the Cavanagh edge” used by some of the best hatmakers after Cavanagh’s first patent expired in 1931. This style remained popular well into the time of the film’s production in the 1950s, when they were worn by stars like James Stewart and Frank Sinatra (who wore Cavanagh hats exclusively). 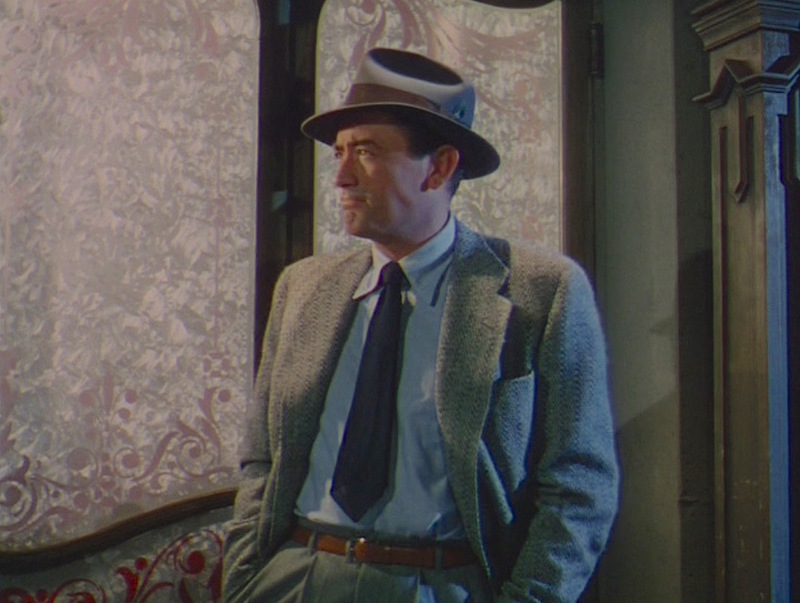 Peck’s Harry Street would wear this same gray fedora with his other lounge suits and sport jackets throughout the film. Another shared match for Harry and Cynthia’s Gauloises. Months later, Harry and Cynthia are living together in Paris when he finishes his first book, The Lost Generation. She catches up with him on the street with the news of its publication while he wears the same jacket, trousers, and belt but with a white shirt, a short teal tie, and the hint of a white linen handkerchief popping up from his jacket’s breast pocket. Cynthia excitedly shares the news of Harry’s imminent publishing, and it’s off to Africa! 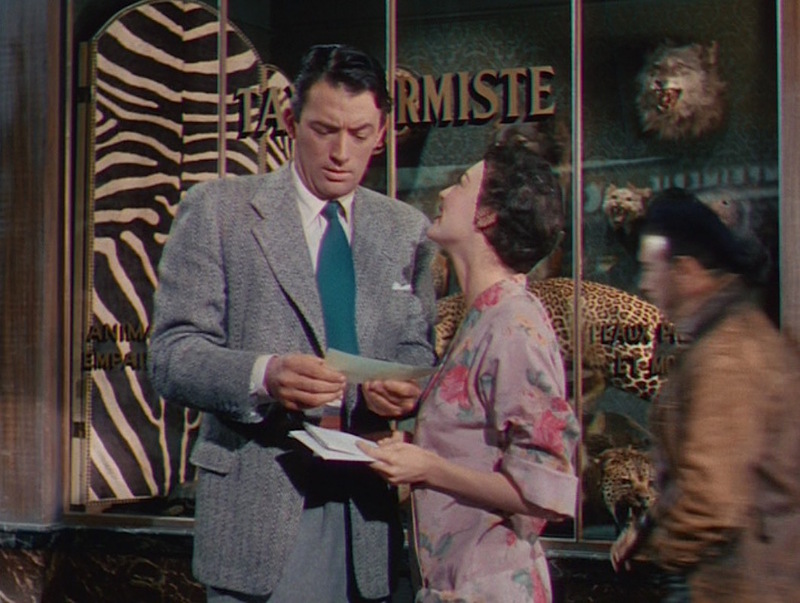 Following that scene, it’s plenty of safari clothing for both Peck and Gardner, something she would be getting rather used to when starring in Mogambo the following year with Clark Gable and Grace Kelly. He wears plenty of tweed when he returns to Europe—sporting brown herringbone when in Spain for the bullfights and a gray mixed tweed suit on the French Riviera—but this distinctive jacket from his salad days in Paris never reappears. Café Emile barmaid: Et, quelle est votre désir? Harry: In English, that’s quite a question. For non-Francophiles, Harry was asked “and, what is your desire?” He ordered “un fine,” or a high-quality brandy, perhaps a shortcut for fine à l’eau, the popular brandy-and-water concoction that featured in several of Ernest Hemingway’s Paris-set books and even made its way into Ian Fleming’s first James Bond novel when 007’s ally René Mathis orders one in Casino Royale. 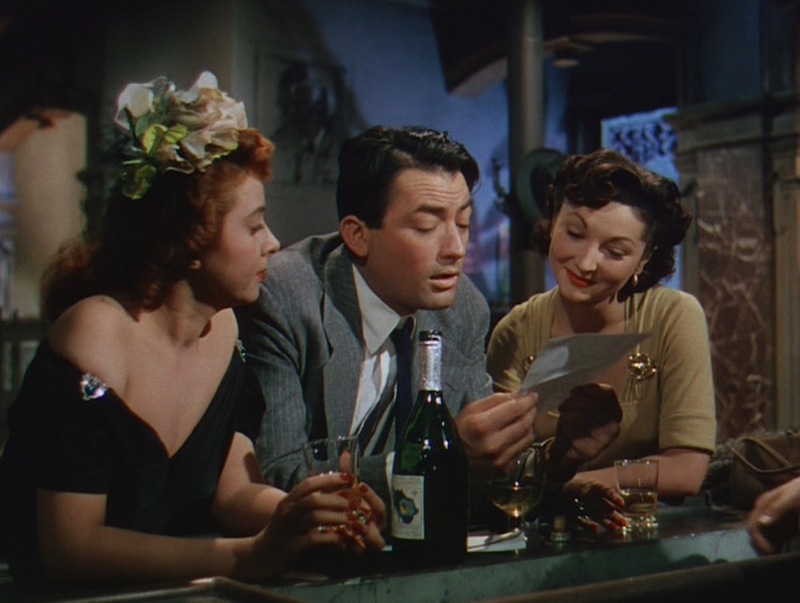 Decades after he was a “young writer”, Harry returns to Café Emile and is surprised and delighted to find that Emile stocks the same brandy behind his bar, and he splits a glass with the two young women accompanying him. Twenty years after he first saw Cynthia in this very location, a drunk and disillusioned Harry returns to Café Emile—and Emile’s cognac—with two dates in tow. But getting back to the roaring twenties… after Harry leaves Café Emile and settles in to hear Benny Carter playing “Blue Mountain” (also known as “Love Is Cynthia”) on his saxophone, he sips a cloudy drink that could only be the classic Lost Generation libation of Pernod and water that features in so many of Hemingway’s works. Between drinks, Harry lights a cigarette and hears “Please?” before he can extinguish his match. Turning to his right, he sees Cynthia—the mysterious woman from Café Emile—with a cigarette suggestively dangling from her lips. “Do you mind?” Cynthia asks after their introductions, picking up Harry’s glass and taking a considerable swallow of the concoction before handing it back. Cynthia: You’d better take this from me, I sometimes drink too much. Harry: Everything’s fair in the pursuit of happiness. 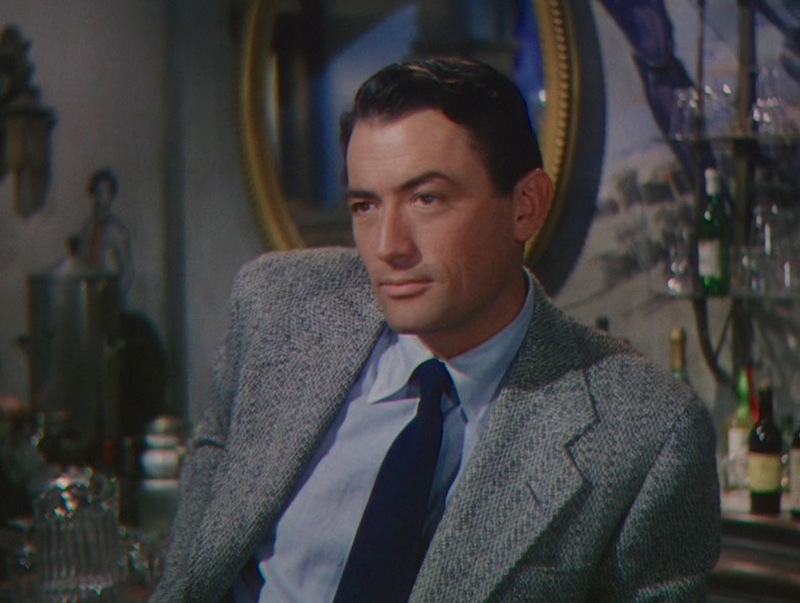 Peck // though the scene is set in the 1920s, peck’s wardrobe would also be fashionable and contemporary for the ’50s (some may argue moreso), but it’s a timeless touch that keeps his character from looking dated. while not perhaps the most historically accurate depiction of what would have been seen on the streets of Jazz Age Paris, it’s nice. Check out the movie and Papa’s original short story. 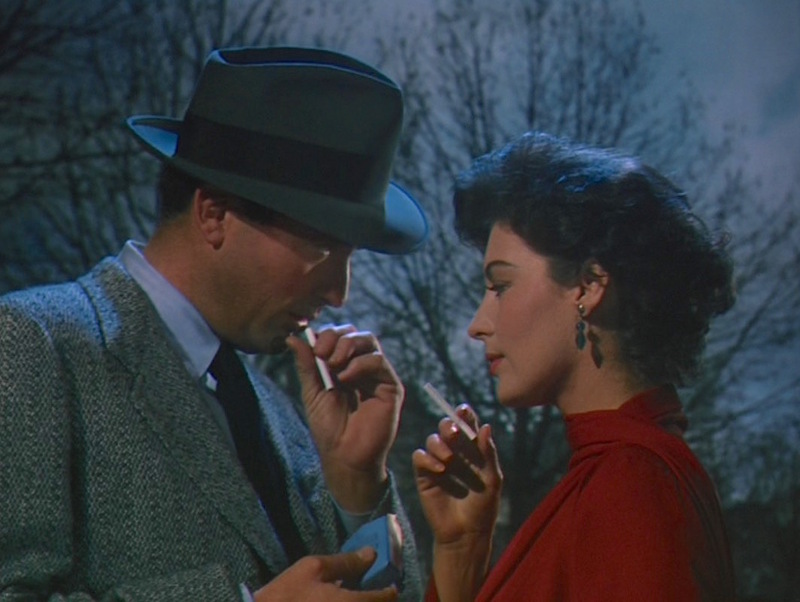 Since the film spent years in the public domain, make sure you’re finding a worthwhile print of it to see the stunning, Oscar-nominated cinematography and art decoration (as well as Ava Gardner) in full Technicolor; the DVD box set included in The Ernest Hemingway Classics Collection offered by 20th Century Fox seems to be a good bet, and it was that set that provided the screenshots in this post. …and a screenshot of the same scene from one of the many low-quality public domain prints floating around the Internet. It’s a case of avoiding a broken nose, Emile—mine or old Compton’s—because a laugh like hers would just have to lead it to a lousy fight. I just watched this movie last night. 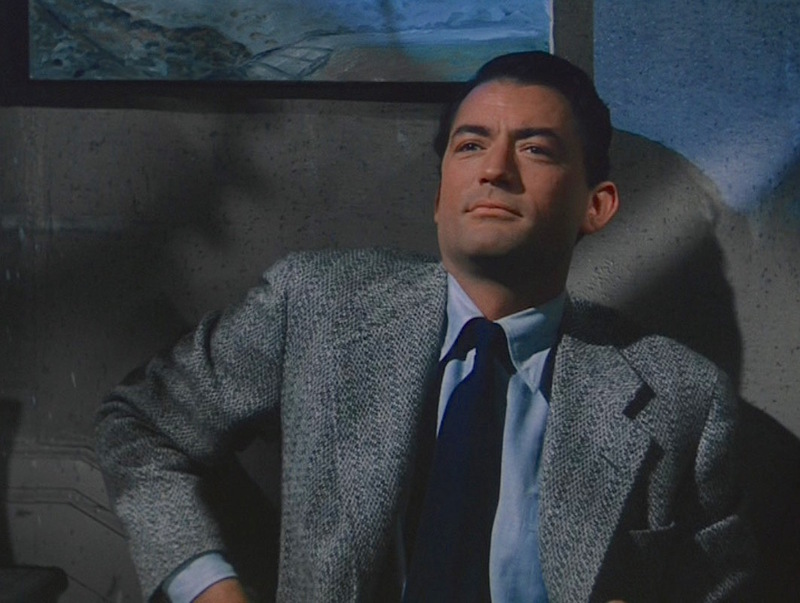 The wardrobe and cinematography stand out more than the story, but I’ll watch Gregory Peck in anything, so it’s all right.